Tim is CEO of Investors Community Bank and one of ICB’s four founders. He has more than 25 years of banking experience in agricultural and commercial banking. Tim holds a Bachelor’s Degree of Business in Management and Economics from the University of Wisconsin-River Falls and a degree from the Graduate School of Banking of the University of Wisconsin-Madison. He volunteers with many business, financial and charitable organizations, including serving as a NEW North Board member, Wisconsin Business Development Corporation board member and is active with the Manitowoc/Two Rivers YMCA. He was a co-founder and past board member of Progress Lakeshore, Manitowoc County’s economic development agency and in 2006 he was named the Wisconsin US Small Business Administration Financial Services Champion. Mark is President of Investors Community Bank and one of its four founders. He has more than 40 years of agricultural lending experience and previously owned and operated Heartland Dairy, LLC, a dairy farm, for 15 years. Mark holds a Bachelor’s Degree in Agri-Business with a minor in Economics from the University of Wisconsin-Platteville. He was instrumental in redesigning the Farm Service Agency’s Guaranteed Loan Program and assisted in the Wisconsin Housing Economic Development Authority’s Credit Relief Outreach Program for Wisconsin’s farmers. He is a board member of the Professional Dairy Producers of Wisconsin and The Crossing, and coached baseball and hockey for many years. Glen is Executive Vice President – Chief Financial Officer of Investors Community Bank. He also serves as Treasurer and Chief Financial Officer of County Bancorp, Inc., the holding company for Investors Community Bank. Stiteley holds a BBA in accounting from Eastern Michigan University and earned a CPA designation from the State of Illinois. He also completed the University Of Virginia Darden School Of Business Executive Program in Bank Financial Leadership. Prior to joining Investors he was CFO for First Community Financial Partners, Inc. a $1.3 billion NASDAQ registered, bank holding company headquartered in Joliet, Illinois. Dave is Executive Vice President - Chief Banking Officer of Investors Community Bank. He has been with the bank since 2009 and has nearly 40 years of lending and leadership experience, including 10 years as president of Business Lending Group and 24 years in various lending and leadership roles in the Farm Credit System. Dave holds a Bachelor’s Degree from the University of Wisconsin-River Falls. He is actively involved in many community/professional organizations, including serving as a board member and finance committee member for Progress Lakeshore and a member of the Wisconsin Bankers Association Government Relations Committee. He is also a recent past chair of the WBA Ag Bankers Section. John is Executive Vice President - Chief Credit Officer of Investors Community Bank. He holds a Bachelor of Science degree in food and resource economics from the University of Florida. He joined ICB in 2018, and has more than 30 years of experience in management, credit approval, structuring and administration; as well as vast experience in special assets, government, commercial and agricultural lending in his home state of Florida. He is also an active community volunteer. Bill is Senior Vice President - Business Banking at Investors Community Bank. He joined ICB in 2016 when they merged with The Business Bank, where Bill served as President and CEO. Bill has almost 30 years of sales and banking experience. He holds a Bachelor’s of Business Administration from St. Norbert College. Bill is very active in the community, where he has served on many nonprofit boards. Currently, he is board president of ThedaCare Foundation in Appleton and a board member of the YMCA Fox West. Matt is Senior Vice President – Banking Services at Investors Community Bank. He has been with ICB since 2016. Prior to joining ICB he spent more than 15 years in the banking and financial services industry holding positions in a variety of business lines including retail, wealth, lending, treasury management and leadership. Matt holds a BBA in Finance and Economics from the University of Wisconsin – Oshkosh and has attended both UW-Madison’s Graduate School of Banking and the Schneider School of Business Center for Exceptional Leadership at St. Norbert College. Matt is actively involved in the community participating with organizations such as Junior Achievement and the Fox Cities Chamber of Commerce. Tim is Senior Vice President – Ag Banking. He has been with ICB since 2017. He has more than 25 years of banking experience, including seven years in ag banking. He has held positions as regional vice president for an agriculture financial services company and as first vice president at another bank in Indiana. He holds a bachelor’s degree from Indiana University. Tim has volunteered his time with various community organizations including serving on the executive committee for the Friends of the Snite Museum at the University of Notre Dame, serving as Chair of the St. Pius X Parish Finance Committee and as Assistant Scout Master for a Boy Scout troop in Indiana. Mark is Executive Vice President - Counsel and Chief Risk Officer of Investors Community Bank. He has been with ICB since 2011. Prior to joining ICB, he served as CEO & shareholder of Whyte Hirschboeck Dudek, SC, President of Miller Implement Co., Inc. and a shareholder of Miller & Miller, SC. Mark holds a Bachelor of Arts degree from the University of Chicago, a Juris Doctor degree from Marquette University and is a member of the State Bar of Wisconsin. His community involvement includes holding executive committee or officer positions for United Performing Arts Fund, Inc., Junior Achievement of Wisconsin, Inc., Holy Family Memorial, Inc. and Marco Services, Inc. In 2009, Mark was named one of the five most powerful lawyers by Milwaukee Business Journal. Laura is Senior Vice President - Marketing at Investors Community Bank. She has been with ICB since 2014. Prior to joining the bank she worked in healthcare marketing and owned a marketing consulting firm serving Northeast Wisconsin. She holds a Bachelor of Science degree in English/Journalism from Northern Michigan University and volunteers with several community and professional organizations, including serving on the board of Holiday House of Manitowoc County, the Progress Lakeshore Marketing Committee, Northeast Wisconsin Manufacturing Alliance Communications Committee, Wisconsin Bankers Association Marketing Committee and The Chamber of Manitowoc County Marketing Committee and Stronger Together Team. She is also a past board member and chair of the Manitowoc chamber. Cyrene is Senior Vice President - Operations at Investors Community Bank and has been with ICB since 2011. She previously held the position of VP-Loan Operations Manager at ICB and has more than 20 years of banking experience in a variety of roles including accounting, human resources, operations, lending and administration. She is pursuing a degree from Fox Valley Technical College in Appleton, WI. Cyrene is actively involved in industry organizations, holding positions as a board member of the Risk Management Association-Wisconsin Chapter and she is involved with the Wisconsin Fiserv User Group. Sign up for our email to stay up to date on bank news. 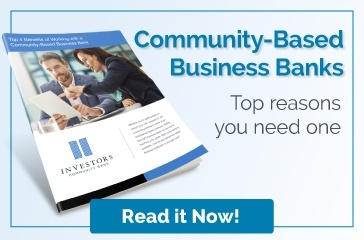 At Investors Community Bank, we want everyone who visits our web site to feel welcome. We are continually working on enhancing our site to make it more accessible for all our visitors. In order to do that, we’ve been following the Web Content Accessibility Guidelines (WCAG) 2.0 to make web content more accessible for people with disabilities and more user friendly for everyone. We are using Siteimprove as our third party accessibility, compliance and website governance partner. If you have any questions or concerns, contact us at 1-888-686-9998.